It’s been two years since Hulu launched its live service and the television industry has changed dramatically in this time. With 33 million adults cutting the cord in 2018 alone, there’s been a massive shift in demand as more viewers turn towards television that’s delivered over the internet as their main channel for live sports, news, and episodes of their favorite shows. 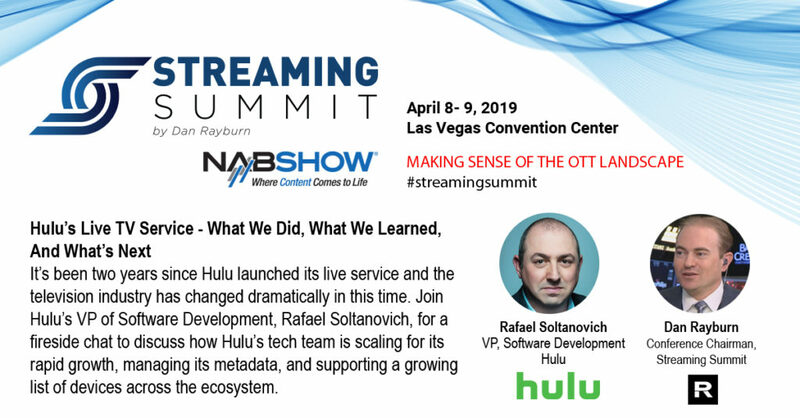 At the Streaming Summit, taking place April 8-9, at the NAB Show, Rafael Soltanovich, VP, Software Development at Hulu, will discuss how Hulu’s tech team is scaling for its rapid growth, managing its metadata, and supporting a growing list of devices across the ecosystem.